I received an e-mail today from a college friend. She explained that she read my blog and that in dealing with the Spanish people and their insularity, I needed to be more aggressive and more confident and ‘grab the bull by the horns’. Those were not her words exactly, but the gist of what her e-mail said (or at least what I implied it to mean). I wrote back that it wasn’t I who needed to be more aggressive and confident, but the Spanish people who needed to be more open. While I still hold fast to that, I do think that there is room for me to be aggressive in other ways. For start, I have been very discontent with my living situation. I have moved three times in the past two and one half weeks and I was not eager to move again. However, I knew that I could not remain in the same living situation and have an enjoyable experience in Madrid. I became aggressive and actively sought out places all while trying to complete my school work, attend to the flat I’m in now, and look for jobs. After a few days of emailing, internet surfing, and phone calls, I was able to secure my own studio in a very hip, trendy part of town. As I was visiting my new flat with the letting agency, I saw a sign on the wall with Erika Badu’s picture on it. I was too far away to read it, but I did manage to see October 28. I thought she must be in concert as she just released an album. As soon as I went home, I googled it and found out she had a concert in Madrid THIS WEEK! 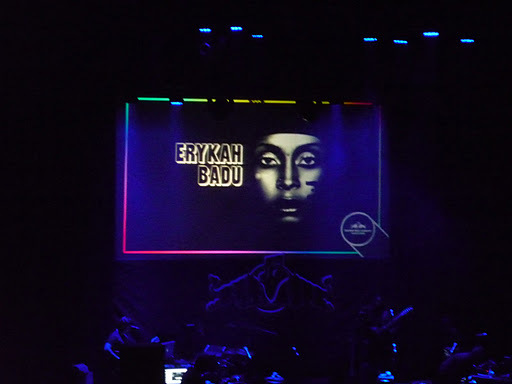 The next day I found my way to the venue and purchased a solo ticket for the window seat to E Badu’s concert. As I made my way to the venue, I noticed a few Black men on the train. I listened to their accent and confidently asked “Are you American”? Their response was as expected “Yes!” They were curious as to how I knew. “One knows their own kind”, I replied. We exchanged pleasantries on the train and it just so happened they were getting off at the same stop as me. They were only in Spain for one day (it seemed quite strange) and they were traveling together. I immediately thought they were a couple, but the one man remarked that his ex-girlfriend’s name is Natasha. While an ex-girlfriend didn’t exclude him from being Gay, I thought maybe they were on the down low and escaping the U.S. for a rendezvous in another country similar to the main character in Baldwin’s Giovanni’s room. We exchanged information and as I bid them farewell I was quite happy with my ability to stir up conversation with random strangers on the train. My new burst of confidence didn’t end there. Upon arrival to my train stop, I spotted a young lady whose hair was not super nice, but manageable. I kindly asked her where she got her hair done, but she told me that she in fact was German and did her own hair. I wasn’t successful, but I had certainly built up courage and confidence. I had noticed him over the past few weeks and only said hello and goodbye. Clearly he was African, but I wasn’t confident enough to stir up conversation, but as I started for the elevator I turned back and then decided to ask him where he was from. He told me that he was from Guinea. I couldn’t believe it. I was excited. The guy I’m seeing (depending on which day of the week you ask me) is from Guinea. I immediately wanted to impress him with my French and Spanish. It was truly all mixed together into a new creolized Frepanish. I explained that I wanted to meet more people of color and wanted to know where they hang out. He told me what hours he worked and that before I moved out of the building he would give me his details. So, after a long few days which have consisted of teaching, studying, trekking across the city to find flats and concert tickets, I felt some hope for the next two months and all I can think about is my friend’s short, but inspirational e-mail and that dreaded cheer leading chant “Be Aggressive B- E Aggressive”!! This is exactly what I am going to do for the next two months!